Tahoe 'Stonehenge'... the Home No One Can Forget... Spectacular! 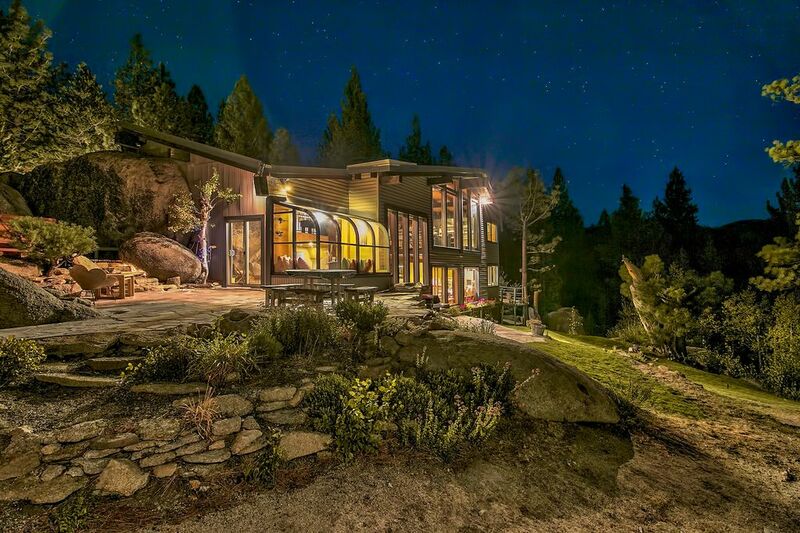 This spectacular, prize-winning executive home is on Lake Tahoe's South Shore. To reach the front door, one must enter into a great stone cavern formed by massive granite boulders under a sod roof. The end of the fifty by thirty-five foot living room is formed by a single stone. In the center of this great room lies another boulder and a mossy trout pond. This brings indoors the natural beauty of the surrounding landscape, patios, and lawns. Two gigantic fireplaces rise and pass through the room's twenty-three foot ceiling. Overlooking all of this are two sweeping, curved balconies which provide additional views of the mountain peaks and green forests that have made the Tahoe Basin world famous. 'Stonehenge' is a beautiful vacation home built on a rocky ridge overlooking the woods and meadows of Tahoe Valley and the crest of the snow-capped Sierra Nevada. It is located at the edge of the El Dorado National Forest and no house or rooftop, nor street or wire, mar its magnificent view. The end of the 50 by 35 foot living room is formed by a single stone. In the center of this great room lies another boulder and a mossy trout pond, bringing the natural beauty of the surrounding landscape, patio and lawns inside. Opposite the living room's glass solarium is the dining room, breakfast corner and tiled kitchen. Two gigantic fireplaces rise and pass through the room's 23 foot ceiling. Overlooking all of this are two sweeping, curved balconies which provide additional views of the mountain peaks and green forests that have made the Tahoe Basin world famous. Each bedroom is decorated with a unique and distinctive decor, the Greek Myth room, the Timberline room, Tyrolean, Mediterranean and Wildlife room. The unusual Austrian-styled 'Strube' has its own stucco fireplace and provides a separate hideaway for games or intimate conversation. A library contains books and memorabilia gathered in travels to distant parts of the world. Mountain climbers who sometimes scale the boulders near 'Stonehenge' acclaim its distinctive setting, intimate and blending with the environment, isolated, yet only five minutes from the center of town, elegantly styled but with a homespun sort of warmth. WEDDINGS, PARTIES, AND OTHER ACTIVITIES ARE NOT ALLOWED. ONLY 14 PEPLES DAY OR NIGHT. Other features include a grand piano, a hot tub, and a library filled with books and memorabilia gathered in travels to distant parts of the world. Mountain climbers who sometimes scale the boulders near 'STONEHENGE' acclaim its distinctive setting; intimate and blending with the environment; isolated, yet only five minutes from the center of town; elegantly styled but with a homespun sort of warmth and comfort. WEDDINGS, PARTIES AND OTHER ACTIVITIES ARE NOT ALLOWED Pet Friendly ... we love dogs & children, so bring the whole family and enjoy! I invited a dozen friends to celebrate my birthday over a weekend at Stonehenge. The main areas are spacious and beautifully designed to create little spots where people can have a moment to themselves but not be too far from the action. There are four bedrooms, a game room, and an upstairs loft area that has two couches. The hot tub is perfectly placed with a stunning view and complete privacy - you feel like the only person in the entire mountain range! Kitchen could use a little updating but was well-stocked. We cooked nearly around the clock and had plenty of dishes and utensils. Bathrooms were clean and well stocked also. The whole decor is a little more quirky and cabin rustic than comes through on the photos; wouldn't say it's very modern. But I think that was part of the charm! Rosmarie was easy to reach and very helpful if we needed anything. Some day, years from now our children and grandkids will be back at Stonehenge. The place is spectacular with all the toys and tools any one could use. We love it! This place is just magical. sits on top of a hill view unbeatable views right out your back door. we stayed with two other families and our kids were always outside climbing on the rocks and exploring. You'll be hard pressed to find a funkier house than this one. Dishwasher broke while we were there and the owner, who always made herself available, had a repairman there the next morning to fix the problem. She also recommended that we go to Angora Lakes while we visited Tahoe. We did - and you should too! Highly recommend this hidden gem. We really had a great time at Stonehenge. We were travelling with our adult children and grandkids, ages 2-8, and it was perfect for us. The kids loved all the unique, natural features the home and property offers, It was fun to watch for the chipmunks and rabbits to come by in the morning, and there were lots of rocks to climb. The views were phenomenal, and we couldn't help but wonder what it looks like in the winter. For us, the trip was really about spending time with our grandkids and giving them a place to stay that they will never forget. Rosmarie was very responsive and accessible when we had questions before our trip. I loved the family touches inside. We truly enjoyed our stay. Thank you so much! Beautiful property. Very tranquil. Kitchen well stocked. We had a great stay. Scott and hes friends are guest you really want to have at your home. great great renters. Please come back again. My friends and I go on a yearly cabin/snowboarding trip and decided to stay in Tahoe this year. Everyone loved Stonehenge; it was very large and spacious with beautiful architecture and decorations. The yard is HUGE and windows made for a great way to wake up in the morning. Rosmarie is also very quick with getting back to requests for any help. Thanks for the great stay! Hi Justen . I am very happy your stay at Stonehenge was memorable. PLEASE CALL US FOR WEEKLY OR LONGER STAY RATES LAST MINUTES BOOKING AND OTHER GREAT DEALS July and August 5 nights min.